Pardon the macabre nature of this post, but I wanted to call attention to how often cars come to killing pedestrians and cyclists. It frightens the daylights out of me. Drivers of cars are oblivious they are when they are hauling around this ton of metal. It’s bad enough that car drivers are gradually eliminating the climate as we know it; they also have a gigantic capability to issue a fatal blow to another human without trying very hard. I vividly recall a tragic moment from my college years. I was speeding down a country road — taking a short cut to reach the highway to San Antonio and I crushed a fairly large turtle in the middle of the road which was lunging away from me as fast as a turtle could. I also remember a time when my dog got loose and ran onto a crowded road and was hit by a car. As tragic as these deaths were, I recognized that for drivers it was more dangerous to swerve away from these animals than to crash into them. The nightmare scenario involved swerving to miss a cat and running into an SUV and killing everybody in the process. Another vivid college memory. While driving my parents to San Antonio, I got a traffic ticket for speeding. My dad never let me hear the end of it. On the way home, my dad insisted on driving, with me on the passenger seat (my mom went home separately). We turned into Schulenberg to get gas, and as we headed to a four way stop on the feeder, my dad accidentally pushed his foot on the gas instead of the break. The action flustered him so badly that he didn’t realize what had happened; he thought the car was out of control. We looked ahead and we saw an 18 wheeler truck ahead of us which we would surely hit. I quickly honked the horn several times, and the truck driver and another driver managed to yield to us while we flew past the stop sign and back onto the freeway again. Eventually my dad realized that the problem was merely a misplaced foot, but we both recognized that this random mistake could have cost us our lives. Years later, both of us would recall that incident with the same feeling of trepidation and the sense that my quick thinking (and luck) had probably saved our lives. Those are memorable moments, to be sure. And I’ve had several small accidents which could have been worse than they were. But I have had a LOT more near misses as a pedestrian or cyclist than as a driver. In 1991 or 1992 on Kirby and West Alabama, I was knocked off my bike by a pizza delivery boy in a pick up truck. He just hadn’t seen me. Maybe he wasn’t paying attention; who knows? He was sorry (and did pay for my bike). Luckily I wasn’t hurt. A few years later in the Rice Village, I was waiting at a stop light on the right lane. Various cars were inching forward to turn right on the red light. Even though I wasn’t at the front of the line, all the cars ahead of me had advanced and turned right at the red, so I ended up moving forward also. Then the car behind me turned right – brushing me down swiftly. The driver hopped out apologetically. He was a doctor and obviously a responsible person. He had hit me after coasting a few yards and accelerating. It didn’t hurt me or my bike, but it scared me because it was so unexpected. It never occurred to me that a stationary car at a red light could just run into me. As the doctor went back to his car, he said, “Be careful!”. “No, you be careful!” I jeered in as contempuous a tone as possible. I can’t find the video or article in question, but a pedestrian once crossed a busy intersection with her two children of elementary school age. Both kids were killed, and instead of the driver being charged with involuntary manslaughter or just ticketed, the mother herself was charged with a felony. All right, you say, what kind of crazy woman would walk with her kids across a busy street? As it turns out, the situation was substantially more complicated. The mother lived in an apartment complex with a few hundred residents. There was no crosswalk to walk down; the nearest one was a mile in the opposite direction. There was not even a path to this nearest red light/crosswalk. There were simply tall weeds. Many of the apartment dwellers who didn’t have cars crossed the middle of the street in the same way. The woman eventually escaped the felony charge, but this horrifying incident underscores how bad urban planning often is partly to blame. A woman who is happily chatting away on the telephone makes a rolling right turn without stopping or realizing that she has just crushed a pedestrian or bicyclist who had been trying to cross the street. That split second that matters – when the woman is busy talking about Starbucks or the latest episode of the Bachelor or sharing the latest office gossip – is the moment which will determine whether I will live or die. About a month ago I was at a complete stop while waiting for the light to go green. In the meantime, a woman in a Honda on a cellphone just coasted by me to take a quick right turn on the red. She did not see me and practically hit me. She was going only 10 miles an hour (if that much) but the sudden acceleration to take advantage in the traffic lull was unexpected and downright scary. When that happened, I immediately backed away from the curb to the sidewalk only to have the very next car (another girl talking on the cell phone) do the exact same thing! Here is another scenario which happens almost once a month. I am on a side road on Westheimer – Greenridge(the same one where the woman almost hit me). 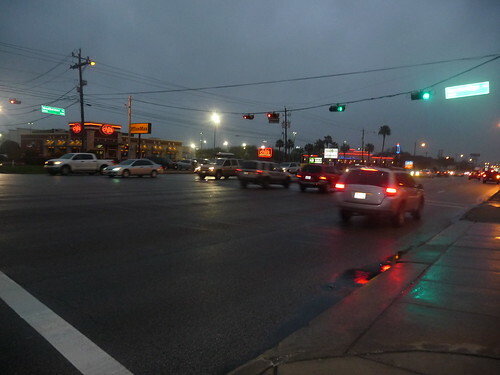 Westheimer is a major Houston street, but at this red light intersection, there is no protected green. I am on my bicycle and waiting to cross Westheimer. I am not turning right; I just want to cross Westheimer and continue down the same road to my apartment. But oncoming traffic wants only to make a right turn onto Westheimer. Westheimer is where everybody wants to be, you see. So the light turns green, and I ride straight. Normally, when there is no protected right turn on green, you are always supposed to yield to oncoming traffic. But here’s the thing. Oncoming traffic almost never yields to a bicyclist going straight ahead in the opposite direction. Instead, oncoming cars usually tear ahead of me to turn left onto Westheimer. Occasionally it’s because the driver hasn’t noticed me, but most of the time it’s because the driver just feels that even though the bicyclist has the right of way, the car (by virtual of its size) doesn’t need to, and instead the bicyclist needs to do the yielding. This ambiguity is what creates the danger. These are regular occurrences for me. I read a horrifying article about bike safety. It reported fatalities involving many experienced and safety-conscious bicyclists who were wearing all the right gear and obeying traffic regulations to the letter. The problem they didn’t anticipate is that the driver would never see them; either they weren’t paying attention or weren’t attuned to this kind of distraction. There are these amazing bike lights called Knog lights which shout their presence to cars. The problem is that if you are coming at a less-than-ideal angle or speeding, this extra light may not do anything to deter a driver’s behavior. Drivers are always killing bicyclists and pedestrians, but bicyclists and pedestrians never kill drivers. That’s the way of the world. The only way these flaws of urban planning are corrected when a death of a cyclist or pedestrian is particularly horrific. If I am one of the unlucky ones, perhaps they will stumble upon this blog post and realized that the danger was always there and acknowledged – but no one bothered to do anything about it. From now on, I will compile a list of these strange drivers who through stupidity or inattention nearly killed me. Oct 1, 2012. I exited my Metro bus, and when the light turned green, I was nearly going to walk on the crosswalk when a man in his fifties hurriedly drove to the intersection and stopped 3/4 of the way into the crosswalk. If I had not been particularly careful, or if I had started walking when the light turned green, he would have certainly hit me. I was so shocked that I yelled out the man (I was wearing a business shirt and slacks). But the man was fiddling with his radio and he didn’t even notice me. Oct 17, 2012. I was riding my bike early in the morning. I was ready to cross Voss at Voss and Westheimer. I had a WALK sign, but one of the oncoming SUVs from Westheimer was 1/3 through a right turn when the person noticed me. I think the driver knew I was there (there were no cars on the road), but I was amazed that the car never really stopped when turning right and how close the car actually got to me. Oct 20, 2012. (Voss/Westheimer) A young Indian man in a small car was talking casually on the phone to a friend, and as he turned right on a red light, just happened to notice that unless he slowed down he would surely kill me! Oct 21, 2012. 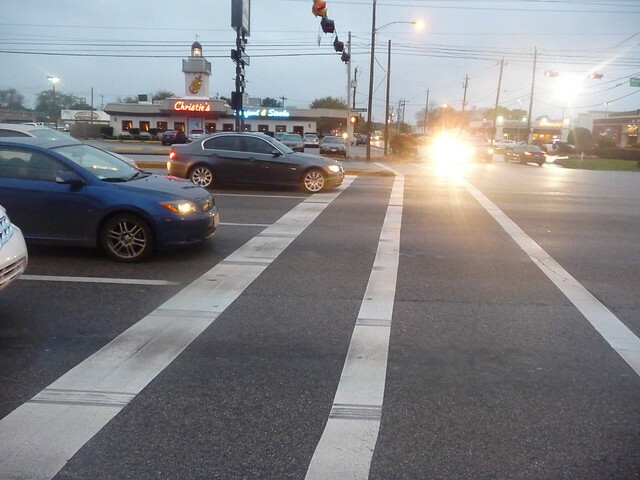 (Greenridge/Westheimer)At a red light, an impatient man in a huge pick up truck gave me a dirty look when he realized that I was manning the pedestrian lane and ready to go forward on the green. This man clearly saw me, but the way he drove ferociously to cross the pedestrian path ahead of me was frightening. Pick up trucks not only are loud, but they can accelerate very quickly. January 18, 2013 (Richmond and Fountain View). A cute and well dressed lady in a small car was preparing to turn right at Richmond to Highway 59. The light was red and she was inching forward to turn right on red, but she didn’t notice that I had already started to walk my bike across the street. Luckily, she caught herself by the time her car came within 4 or 5 feet of me. Close call! She gave me the usual humorous and apologetic expression that suggested she certainly had no idea she was so close to running me over. I guess I should be relieved that she looked so apologetic; on the other hand, tigers tend to be very playful and friendly to their prey before they tear them to pieces! May 13, 2013 (Greenridge/Westheimer). A Toyota Camry sped up to beat a red light and in the process nearly destroyed my life force. I’m careful enough now to count 5 seconds before crossing the street, but it’s still shocking to think that for the inexperienced bike rider, he or she would never be alert to this possibility. August 2, 2013 (Greenridge/Westheimer). This is not a near miss, but a VERY scary situation. A man driving a huge SUV that was very elevated off the ground, was at a red light, and so was I. We were waiting together. I was ahead of him and planning to go straight. The SUV driver was planning to turn right onto Westheimer. But his hood was so high off the ground that he probably couldn’t see me or my bike — and I’m a tall person! He was pleasantly talking on the phone to someone, while inching ahead. I tried signaling him with my hands to make him aware of my presence; eventually I started shouting! But the man was unable to hear. The SUV had insulated all the outside noises, and plus he wanted to hear what his buddy was saying to him about the latest game. I was almost ready to back off and just let him pass — a sudden jerk of 2 or 3 feet could possibly destroy me and my bike. But as luck would have it, the man was a cautious driver and he waited a few seconds for the red light to turn green before advancing. September 25, 2013. (Fountain View & Woodway). A totally bizarre encounter. An older woman on a cell phone was trying to make a right turn on a red. She was inching her car slowly ahead. But it didn’t occur to her that there was one bicyclist (me!) and a pedestrian waving frantically from her right trying to get her attention so we could walk across the crosswalk to the other side. We were yelling at the top of our voices, but the woman could not hear. She was still talking on her phone, waiting for the right opportunity to turn a rapid right. But the woman never saw us; we had the right of way; we had limited time to cross the street, yet this woman’s phone conversation made her so oblivious to the people 4 feet away from her that the pedestrian and I decided to wait for the light to turn green and red again before trying to cross. October 11, 2013. (Greenridge/Westheimer). An Indian woman and her daughter in a gigantic SUV (Range Rover) were in a parking lot driveway for a strip mall with a red light. She was trying to make a right turn onto Westheimer on the red. Even though she clearly saw my bike go by, she didn’t realize that I was parked to her right at the right side of the lane — prepared to go forward. Again, the bad angle of the SUV driver seat made it hard for her to see me, but her daughter in the passenger seat finally noticed me, so the woman waved me ahead. November 6, 2013. (Greenridge/Westheimer). At 6 PM I tried to ride across the street when the light turned green. But three cars coming in my direction decided that rather than yield to me — that was only the LAW — they would simply turn left ahead of me and hope that I would yield. December 17, 2013 (Greenridge/Westheimer). At about 5:30 PM, I almost got hit by an SUV driver who cut in front of me from the Chilis parking lot driveway. (Ironically it occurred 15 seconds after 2 cars cut me off by going left when I had the green light on Westheimer). The SUV came within 5 feet of me and after I yelled at the driver — he did slow down, but luckily I had time to brake to prevent a collision. (H ave I told you that I’m paranoid about SUVs?!) The driver slowed down to lecture me about why I didn’t wear reflective clothing. Sadly, I have to conclude that even if I had done that — he probably wouldn’t have seen me anyway. The problem was the high position of the SUV obstructed a bike level line of sight, and that the driver simply wasn’t looking for me. January 9, 2014 (Greenridge/Westheimer). Almost identical to what happened on November 6, 2013. The situation is that if you are going straight behind another car, cars turning left will be totally surprised to see a bicyclist behind a driver. It is really hellish to be behind a car who has already turned and face a car who is trying to turn left in front of you. The question becomes: do you keep going (and stay consistent) or do you slow down and create more uncertainty? Update #1. Strangely, I happen to know personally the woman who was charged with fatally hitting a bicyclist and failed to render aid. To me the driver was nice but somewhat clueless — certainly no monster. I tend to think she is mostly culpable, but Houston roads generally make it hard for bicyclists to ride apart from cars with any degree of safety. Previous post: Why does Comcast require 4 months to send a $20 refund?